Gold and silver started off Tuesday down a bit as precious metals are not looking as safe of an investment as they usually are. Economic indicators from around the world have caused many market experts to believe that easy money policies from around the world may have only a limited lifespan. Any news which alludes to the fact that easy monetary policies in places like the US and Japan might be coming to an end are negative for most commodities, including gold and silver. Yesterday, the Standards & Poors credit rating organization shifted their view of the US credit rating from negative to stable. This small, yet important shift is a big indicator that the US economy is doing much better than it was only a year ago. This news, coupled with the fact that employment is at near-normal levels, means that Quantitative Easing in the US might have its days numbered. This is all despite the fact that St. Louis Federal Reserve president, James Bullard, stated that he thinks monetary easing may stay in effect for a little while longer than this summer. The Bank of Japan, in their meeting this week, announced no major changes to their monetary policy which has actually caused many people to believe that it central bank too might end easy money policies in the near future. Bonds and stocks from around the world are in the midst of a strong urge to sell by investors from all over the world. Most recently, Greek government bond yields have been approaching 10% and are looking like they will be sold in droves today. Rising bond yields in general hurt the European stock market today, especially in already bleak economic areas such as Spain and Italy. If that wasn’t enough, even bond yields in Germany were rising slowly at the beginning of the day. In the middle of all this bond chaos, courts in Germany are in the process of deciding if the EU’s present financial bailout package is even legal in Germany. This is a decent bit of information to take in, but it all points to the fact that the crisis that has been hovering over Europe may quickly evolve into a whirlwind. Like we have been saying for months, someone or some group needs to take control in Europe because things are beginning to get out of hand there. Another aspect of the world marketplace that is not doing gold and silver any favors is the fact that physical demand for the metal is inordinately low. In places like India, where gold is typically flying off the shelves at any and all times, demand for the yellow metal is at a shockingly low point. As we move forward into the duration of the week, one of the major things we will watch out for is how the world marketplace is viewing precious metals. As of now it is not being looked at as a safe-haven asset, something that is essential for sustaining a higher value. European bond yields will undoubtedly move gold further on the day, but it will be interesting to see if today’s bond and stock activities will carry over into tomorrow. This entry was posted in News on June 11, 2013 by bsccom. Gold and silver both dropped most of Mondays substantial gains in the early morning hours of Tuesday, building on precious metals’ recent volatile nature. Even though the end of Monday saw gold finish above the $1,400 mark by quite a bit, by a little after 9 AM it was right back into the $1,390s. Some weak US and European economic data prompted value buying yesterday and that was likely the main cause behind precious metals’ gains. The OECD, or Organization for Economic Cooperation and Development, made an announcement that inflation throughout the most highly developed countries fell to over 3 year lows in April. This report will likely only add fuel to the fire that is the central banks across the globe pumping money into their economies at alarming rates. The Consumer Price Index rose by only 3 tenths of a percentage point over one in April, compared to a 1.6% annual rise this past March. It is generally agreed upon that a rise of the CPI anywhere under 2% is inconsequential and thus should not be worried about. On Tuesday the European Union announced that producer prices fell by a little over half of a percentage point this past April. This most recent decline is the largest such drop off in producer prices in almost half of a decade. This news will add to the intrigue and speculation circling around the upcoming meeting of the European Central Bank which is set to take place this upcoming Thursday. Another big reason behind gold’s early morning decline is the fact that the USD Index is coming in a bit stronger today than it was yesterday, when it hit near 4 year lows. On Tuesday we are expecting a retail sales report as well as a trade deficit report which have the ability to influence the precious metals markets one way or another. As stated earlier, investors around the globe will be anxiously awaiting the European Central Bank that is set to take place on Thursday. On Friday of this week a US unemployment report will be the focal point for investors and market watchers. Other than these two reports later in the week there really isn’t any huge headlines upcoming in the next few days. This entry was posted in News on June 4, 2013 by bsccom. With the weekend and Monday bringing little news in regards to precious metals, we can expect Tuesday to be a different story entirely. As citizens of the United States took the day off on Monday in observance of the Memorial Day Holiday, little movement was recorded in the metals markets and in much of the rest of the world. As Tuesday got underway, gold lost closer to ten dollars right out of the gate while silver lost a little over twenty cents. With some economic news expected to be released in the United States, that is what investors will be paying closest attention to. After last week confirmed the rumors circling around the subject of monetary easing in the US, investors will take a new interest in every bit of news regarding the US economy. On Tuesday the US manufacturing index, housing price index, and consumer confidence index are all going to be announced. Every time these reports are released, investors keep a close eye on them, but with the future of Quantitative Easing in limbo right now, economic numbers from now forward will carry a heavier weight as far as speculation goes. These reports will be early indicators if the US economy is growing, stagnating, or contracting in the first part of 2013. Despite there being a substantially small amount of market-related news stories to report in the early parts of Tuesday, gold still managed to post disappointing numbers. Typically, marketplaces are significantly quieter than normal after a holiday in the US, but gold has fallen straight away the day after Memorial Day. Perhaps the blame can be placed on moderately higher US and European stocks. After last week’s temporary lull, Asian markets are once again posting impressive numbers as well. In other news, a board member of the European Central Bank said the region and bank plan to retain easy monetary policy for as long as they deem it to be necessary. While the US is in talks of toning down their monetary policy in the near future, much of the rest of the world is in the midst of very aggressive money policies. So far it has done a good job of boosting economies in places like Germany and Japan, but it is unclear as to how it will fare for these nations in the long-run. As the week moves forward the biggest thing investors will have their eyes on are world stock markets. In addition to that, investors will keep their eyes peeled on how the Japanese Yen and the US Dollar interact. Lately the USD has been gaining rapidly against the Yen, though at the end of last week these gains were slowed a bit. This entry was posted in News on May 28, 2013 by bsccom. Gold and silver experienced a late day surge on Monday which cancelled out early morning losses and gave investors a small glimmer of hope heading into the next four days of the week. As you could have probably expected, those gains began backtracking early on Tuesday as gold and silver both started the day down a bit. Around 9 AM on Tuesday gold was back down about 15 dollars while silver had lost over 50 cents already. There is little precious metals market-relevant news set to be released on Tuesday, but Wednesday is a very different story. Though there is little for investors to watch on Tuesday besides a retail sales report out of the United States, Wednesday will see all precious metals investors keeping their eyes fixated on Ben Bernanke’s speech to Congress about the state of the economy and monetary policy. The Federal Open Market Committee’s notes are going to be released on Wednesday as well which always has the chance to influence spot prices one way or another. Investors will be paying such close attention to both the FOMC notes and Ben Bernanke’s speech because it is expected that one of the two will shed some light on the future of monetary policy in the US. While many people are expecting an announcement that sees a timeline for the winding down of Quantitative Easing, we will just have to wait and see if that will be the case. Some folks think that QE will be abruptly stopped, but the more popular thought is that it will be wound down over a period of time as to not throw the marketplace into an upheaval. If it is announced that QE will be suspended or slowed down, you can expect that this news will have a negative impact on both gold and silver. Another story that precious metals investors will be keeping their eye on on Wednesday is the release of the newest slate of Chinese Manufacturing data. At this point it is expected that the data will show less than stellar results which will give even more credence to the thought that China’s economy is slowing down at fairly substantial rates. In other news, the Canadian Dollar fell against the US Dollar as investors in Canada are also expecting an announcement in regards to QE tomorrow. According to Bloomberg.com, Canada’s dollar is merely “following the flow” of currencies declining in value against the Dollar. Bloomberg also suggested that the US’ recently strong economy is reason enough for Bernanke and other members of the Fed to justify a winding down of the QE program. Though most of today’s stories are about news that will be released tomorrow, there are still plenty of other things for you to look out for. For one, any precious metals investor should be keeping their eyes on both the Japanese Nikkei index and the US stock markets as gold and silver have been feeling heavy downward pressure from both entities as of late. It is also advised that you watch how the US Dollar performs as this has been gold and silver’s main combatant as of late. In the early morning hours on Tuesday the USD Index rose which is likely the reason behind why gold and silver started the day on negative notes. This entry was posted in News on May 21, 2013 by bsccom. 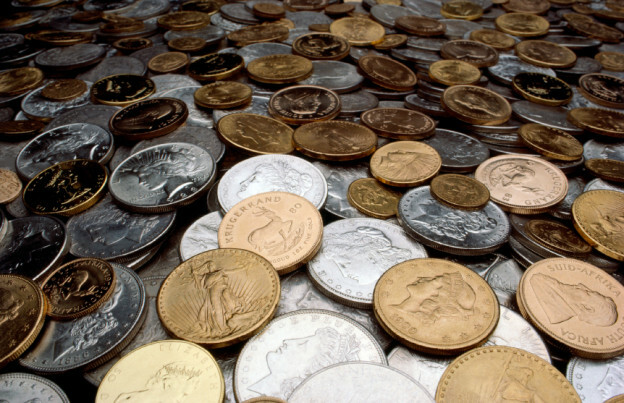 Gold and silver have gotten off to a slow start in the early parts of this week. After posting a double digit loss on Monday, gold bounced back a bit in the overnight and early morning hours only to fall right back down. There were very few big stories to move metals drastically in one direction or another but that did not stop gold from opening on Tuesday down almost ten dollars. Some economic indicators allude to the fact that the European debt crisis might be cooling off and is not as much of a concern to investors as it was only a few months ago. Silver opened trading on Tuesday down over 30 cents. According to Reuters, Gold, thus far in 2013, has fallen by about 14% which is a completely unprecedented number. Most of these losses can be directly tied to a stronger US Dollar, but an improving economic situation in Europe is not helping the yellow metal’s cause either. Some of the good news out of Europe is that industrial production across the region rose by a whole percentage point this past March. This is the biggest such rise in industrial output in about a year and a half. A recent Spanish government bond auction yielded much better numbers than anyone had anticipated which is great news for one of the most disappointing countries in Europe over the course of the past year or so. This does not mean that Spain, or the rest of Europe for that matter, are out of the woods yet, but progress is progress. Hopefully lower interest rates across the region are able to help rampant unemployment among a plethora of other problems. The release of the latest Australian budget hinted at the fact that easier monetary policy may be necessary for the nation’s economy to stay afloat. The release of the budget prompted the Australian dollar to hit its lowest point in almost a full year. According to Marketwatch.com, prices paid for imports in the US fell by about half of a percentage point this past April. Going hand in hand with this news, prices paid for US exports fell by about 3 tenths of a percentage point shy of 1 percent. The lower prices paid for imports are most likely due to the fact that oil prices have been relatively subdued as of late. Gold and silver have been part of a downward trend for over a half year at the present moment and investors are wondering what has to give in order for values of both metals to return to the points they were at this time last year. It seems as though precious metals cannot catch a break anywhere boosted in the fact that futures prices for June are down just as current spot values are. As for the rest of the week, investors and market watchers are going to be anxiously awaiting any news in regards to the end of Quantitative Easing. Rumors have been flying that the easy money policy implemented by the Fed is going to brought to an end, but so far there has been no word as to when or how. This entry was posted in News on May 14, 2013 by bsccom. After a stagnant Monday, a lot of folks were still feeling confident that this week could be a good one for precious metals. Part of the reason Monday was so slow was due to a public holiday that was being celebrated by mostly all of Europe. In the overnight and early morning hours on Tuesday, however, an Australian rates cut, pushed gold’s value downward by about 15 dollars. It is still early in the week which means gold has a great chance of making a comeback, but things are not looking good so far. Recurring themes are everywhere in the world markets as of late, and this time it is the recurring theme of interest rate cutting. No more than a week after the whole of the European Union saw interest rates cut by a quarter of a percentage point. Australia saw their rates cut by 25 basis points. Even though this slashing of rates has caused the price of gold to take a momentary dip in value, experts believe that the slew of countries employing easy monetary will help keep physical gold in high demand. Whenever paper money can be found in abundance, it usually means that precious metals like silver and gold are sought after heavily. If this remains the case, it seems as though it is only a matter of time before gold and silver values rebound to what they were at the beginning of April. Physical demand for gold is still high in many parts of Asia, but especially in India. The reason for this, many believe, is the Akshaya Trithiya holiday which is going to be celebrated in a matter of about 6 days. The Hindus who celebrate this holiday give gold as a gift more times than not as it is away to give a friend or family member a lasting source of wealth. Today, one thing many investors will be keeping their eyes on is a US Labor Department report on just how many jobs were made available this past March. The report will likely be a positive one as a report on unemployment data that was released last Friday indicated that there were far fewer unemployment claims than anyone had anticipated. Good news for the economy, however, could mean bad things for the value of gold because whenever an economy is flourishing, safe-haven demand for gold typically declines. Only time will tell if gold and silver can rebound from these overnight and early morning dips in value. This entry was posted in News on May 7, 2013 by bsccom. In a bit of a surprise announcement, the US Mint has notified Authorized Purchasers that their inventory of American Silver Eagles has been completely depleted, and they will not be taking any new orders until at least January 28th. Although physical shortages became rather commonplace from 2010-2011, the Mint kept up with demand quite well during most of 2012, only selling out once, towards the end of December when they were transitioning to 2013 material. On news of the shortage, silver spot price jumped up a bit, but more importantly, retail premiums for Silver Eagles as well as other products went absolutely through the roof. Retailers like JM Bullion, which typically sell current year Silver Eagles as low as $2.54/oz over spot, immediately hiked prices to nearly $5/oz over spot in anticipation of higher demand, potential delays, and possible supplier price increases. Canadian Silver Maple Leaf premiums followed suit, despite the fact that supply doesn’t seem to be an issue at the moment. 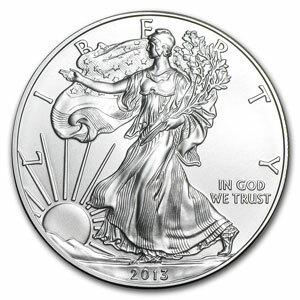 Maples are currently selling for about $0.50 less per ounce than Silver Eagles, which is standard in the retail market. With the US Mint not shipping any new material until at least the 28th, and then beginning their shipments on an allocated basis, retail investors should expect shipment delays into February as Silver Eagles start working their way back down the pipeline. This entry was posted in News on January 19, 2013 by bsccom.